Science fiction looks to the future — but sometimes the future catches up to you. Sometimes, an idea generates tons of great science fiction stories — until science reveals the truth, and kills it dead. Or technology surpasses it. 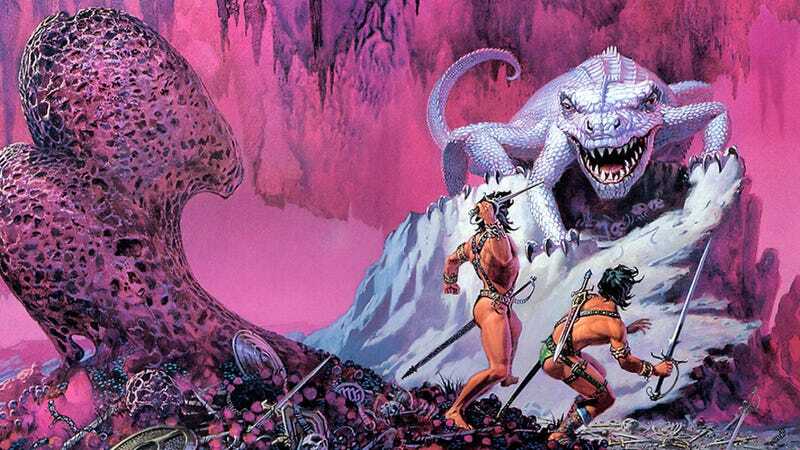 Here are nine scientific breakthroughs that destroyed science fiction subgenres. Top image: Barsoom Art by Michael Whelan. Just over 100 years ago, many people still believed there might be intelligent life on Mars — with Percival Lowell claiming there were "canals" on Mars that were created by intelligent creatures, based on a mis-translation of the Italian word "canali" in astronomer Giovanni Schiaparelli's writing. Soon, H.G. Wells, Edgar Rice Burroughs and a ton of other authors were writing about Martian civilizations. The discovery: We figured out by the late 19th century that the atmosphere of Mars probably couldn't support life, and the "canals" were debunked roughly a century ago. But it wasn't until we were sending space probes to Mars and getting really good images of the surface, around 1971, that the "Mars invades Earth" and "Mars has civilizations on it" stories just dried up. Remember how there used to be tons and tons of stories about the previously unknown "Tenth Planet" in our solar system? This seemed to be inspired by the discovery of Pluto, the "ninth planet," in 1930. Maybe we all just liked the idea that the solar system had ten planets, because ten is a nice round number. For example, there's the Doctor Who episode "The Tenth Planet." In The Puppet Masters by Robert A. Heinlein, the planet after Pluto is called Kalki. In Mostly Harmless by Douglas Adams, the tenth planet is officially called Persephone, but nicknamed Rupert. The discovery: The notion of an extra planet in our solar system was disproved once and for all in 1993 — plus Pluto lost its "planet" status in 2006. There used to be a a massive trope in science fiction about computers running out of memory. William Gibson's Neuromancer has three megabytes of RAM being enough to kill for. Johnny Mnemonic has a character trading his own long-term memory for the ability to carry 80Gb-160Gb of data in his head. 320 causes seizures and headaches. Another example is Michael Crichton's Jurassic Park novel, which has the program that tracked the dinosaurs stop counting when it's reached the number they think they have. Useless when they started breeding, but at the time a reasonable space-saver. Now, a deeply confusing bit of old processor-power management. The discovery: These days, an 160 iPod will set you back about $250. Definitely not worth losing your ability to remember things. Remember silicon-based life forms? They used to be everywhere. Like the Horta in Star Trek, and the Kastrians on Doctor Who. Tons of science fiction writers, starting with H.G. Wells, imagined silicon-based life forms as well. The discovery: At some point in the 1960s, there were some research papers that put a lot of science fiction authors off silicon-based life, according to a panel at a convention we saw years ago. (Sorry about the lack of specifics — turns out the details are hard to track down.) Certainly, our own "Ask a Biogeek" column contains a pretty cogent explanation for why we now think silicon-based life is highly unlikely, including the fragility of silicon's bonds with other elements, and the difficulties of waste disposal. Where Is My Silicon-Based Life? The "Malthusian catastrophe" story used to be a mainstay of science fiction, from Harry Harison's Make Room! Make Room! to Star Trek's "The Mark of Gideon." People spent a lot of time obsessing about the idea of the future suffering from food scarcity based solely on crop yields not being enough for our population. Foundation has Trantor needing twenty agricultural planets to feed 40 billion people. Asimov's Lucky Starr gives Earth a population of six billion, but Earth needs to import food from Mars and Venus. In The Lathe of Heaven, Earth's population is seven billion in 2002 and it's been twenty years since grain could be spared for alcohol! The discovery: The Green Revolution makes food scarcity, without an accompanying other failure (like running out of oil) a much less viable trope. (Although we'll see what happens in the next 40 years.) Still, it's nice to think that we're more hopeful — about some things at least — than we were in the 1960s and 1970s. 7) We can't live on "food pills"
A lot of future worlds, most famously The Jetsons and various episodes of Doctor Who, were fans of showing the food pill replacing meals. This was a huge trope: the pill that contains all the nutrients you need. The discovery: We just know a lot more about nutrition than we used to, and science has shown that we need more than vitamins to survive and that, for example, we can't compress our daily protein requirement into a pill. Mass just doesn't work that way. 8) There's no such thing as "polywater"
Polywater was the idea of polymer made of water, which was a hot scientific idea in the 1960s and seemed like it might be reminiscent of Kurt Vonnegut's "Ice Nine." Star Trek's "The Naked Time" uses polywater as the plot device making the crew act drunk. The novel A Report from Group 17 by Robert C. O'Brien has a type of polywater that brain-washes people and makes them controllable. "Polywater Doodle" is a story by Howard L. Myers, featuring an animal made up solely by polywater, with the metabolism described by Richard Feynman. The discovery: As Interesting Thing of the Day explains, "Polywater samples were subjected to much closer scrutiny, including chemical tests and examination under an electron microscope. Every single sample showed some contamination with impurities of various kinds—in other words, polywater was nothing more than tiny particles of other substances suspended in ordinary water." TNG's "The Naked Now" had to retcon the "polywater" thing, so it could be used again and be consistent with the change in science. There used to be tons of stories about a hidden land full of dinosaurs, lost civilizations or magical beings, somewhere on our Planet. King Kong's Skull Island and Arthur Conan Doyle's The Lost World are good examples, but also Marvel Comics has the Savage Land. In the books, the Land of Oz is also a hidden land on Earth as well. The discovery: We've seen the Earth from space and know what it looks like, and it's harder and harder to believe that there's a huge tract of land that we haven't noticed yet.